18-08-2016. Picture Michael Gillen. FALKIRK. Helix Park. Kelpies. Irn-Bru Challenge Cup, third round draw taking place. Not left to right. Jim Jefferies; Stenhousemuir Grant Hamilton; Airdrieonians, Rohan Ferguson (Goalkeeper); Alloa Athletic: Jack Ross; Ayr United: Nicky Devlin (Captain); Celtic U20: Tommy McIntyre (U20 Manager); East Fife: Dave Marshall (Vice Chairman); Falkirk: Peter Grant; Livingston: Colin Ritchie (Sports Science Coach). Stenhousemuir and Falkirk face re-runs of earlier Cup meetings in the Irn-Bru Cup. 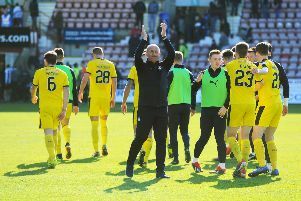 Ex-Bairns boss Jim Jefferies paired Falkirk with Elgin City in a re-run of their BetFred Cup match at The Falkirk Stadium earlier this season. And Stenhousemuir are making the same trip to Dumfries they did last month as they were paired with Queen of the South. The Irn-Bru Cup draw was held at The Kelpies, in the Helix Park.